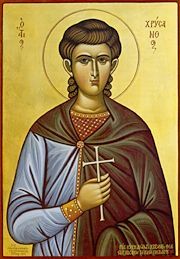 The holy, glorious and right-victorious Martyr Chrysanthus (or Chrysanthos) is a hieromartyr who was killed around AD 283. He is commemorated on March 19 along with his wife St. Daria. Chrysanthus was the only child of an Alexandrian nobleman living in Rome. He was given the best education one could get at that time, and, after reading pagan books which spoke of Christianity, he decided to learn about the new religion himself. He was given a copy of the Four Gospels and the Acts of the Apostles. He quickly finished them and converted to Christianity. His father, upon learning of his son's conversion, tried to tempt Chrysanthus with several prostitutes. Chrysanthus chased them all off and maintained his chastity. His father, in exasperation, finally arranged for him a marriage to a virgin-priestess of Athena, named Daria. Chrysanthus agreed to the marriage but told Daria that he intended on living in chastity. Daria also wished to continue her virginal status and was converted to Christianity on their wedding day. The Emperor Numerian, feeling threatened by the large number of people that Daria and Chrysanthus converted, decided to have Chrysanthus tortured. Both Chrysanthus and Daria were martyred by being put in a large earthen pit, which was then covered by stones, slowly crushing them to death, in the year AD 283.
you drew Daria to saving knowledge. This page was last edited on March 20, 2019, at 21:32.